Fairlane Portable Massage Table is a sleek, portable massage table ideal for students or professionals on a budget. 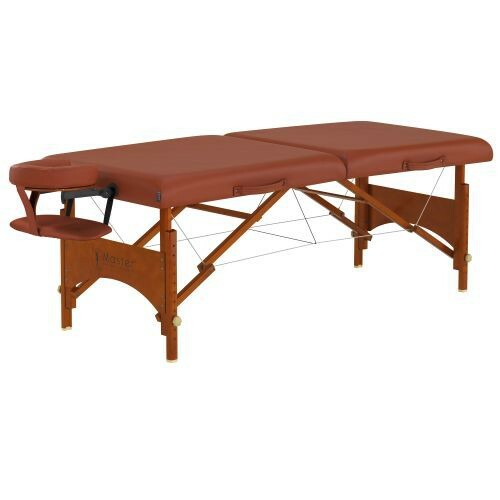 Layered with a two-inch thick cushion made from exclusive multi-layer small cell foam, this comfortable massage and treatment table is both durable and long-lasting. Fairlane Portable Massage Table is designed with managed forest hard European Beech wood with Hi-gloss in a beautiful elm-color. With a working capacity of 550 lbs., this portable massage table is oil and waterproof, and comes with upholstery with denim-like reinforcement backing. You might also be interested in similar portable massage table products that we carry, such as Balboa Portable Massage Table. Layered with two-inch thick cushion made from multi-layer small cell foam. Designed with beautiful managed forest hard European Beech wood with Hi-Gloss. Includes the following free accessories: Innovative, adjustable face cradle, Memory Foam Face Cushion, carrying case and comfortable armsling. Table weighs a mere 28 lbs., making is easy to transport, assemble and disassemble. Oil and waterproof upholstery is long-lasting and durable.